2 bedroom, 2 bathroom condo, with a nice terrace. It has an excellent view to the leisure pool from the master bedroom and the terrace. Fully equipped and decorated. Split air conditioners, one in each room. Lockable storage for owner in the master bedroom, second bedroom and kitchen are already there in case it is rented. Ready to use. The condo has 95 m2 total area, 80 m2 interior + 15 m2 terrace. The building has an elevator. The owner says “This condo is at an outstanding location and has it all”, and he is not exaggerating, the natural surrounding that was kept gives a very private feeling to it. The leisure pool is close by, with a space for a barbeque get together and view to the golf course. Tao development has a wellness center with gym, two lap pools and multiple activities like yoga or dancing lessons, plus a bistro. Tao beach club at a nearby beach. Bahía Principe hotels have more than a dozen gourmet restaurant options that the Tao owners can take advantage of, plus access to some of the facilities, like the adults only pool, beach facility, dolphinarium, 18-hole championship golf course by Robert Trent Jones II, one of the finest in Riviera Maya, plus a 9-hole executive course too. Various nearby beaches and cenotes (sink holes) increase the options for things to do in the area. Akumal bay, where a good number of turtles live, is a few minutes away. 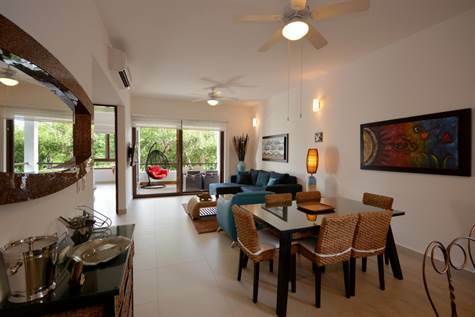 Tulum is 20 minute drive where beautiful beaches, restaurants and other amenities await. Playa del Carmen is within a 25 minute drive.